You come across postal material from Russian Central Asia so infrequently that you forget the geography and the history between one item and the next. I have just tried to improve my background knowledge by reading Seymour Becker's Russia's Protectorates in Central Asia, Bukhara and Khiva 1865 - 1924 . This is an old book (1968) re-issued in 2004 with minimal changes. So it does not make use of any archive material released after the dissolution of the Soviet Union. Nonetheless, I found it interesting and helpful. For example, it gave me an explanation of why stamps with Bukharan (and to a lesser extent) Khivan cancellations are quite common - compared to previous periods - from the period of the First World War and even immediately after. The War disrupted the supply of American cotton to Russia. As a result, Russia turned to Bukhara and Khiva and their cotton production very significantly increased after 1914. So there would have been more commercial mail. Becker's brief account of the evolution of Bukhara and Khiva in the years immediately after the Bolshevik revolution, when short-lived People's Soviet Republics replaced the Emirate and the Khanate, also helps situate the popular Bukharan fiscal stamps of this period and the rare stamps, apparently prepared for postal use, which come from Khorezm (as Khiva was briefly re-named). In the Imperial period, Russian fiscal stamps would have been used in enclaves and activities under Russian jurisdiction. But neither the Khan of Khiva or the Emir of Bukhara used fiscal stamps in their own jurisdictions which were, for most of the nineteenth century, without any kind of printing shops. Before the fall of the Romanovs, neither Bukhara or Khiva ran independent postal or telegraphic services; these were provided by Imperial Russia and stamps used in Khiva and Bukhara are classified as "Used Abroad" (for example, in Part Three of Tchilingirian and Stephen's Stamps of the Russian Empire Used Abroad (1958)). But as supposedly independent people's republics, from 1920 to 1923, both Khiva and Bukhara operated independent post and telegraph services, though how extensive those services were I do not know. From the period before 1900, and except for Tashkent, material from Central Asia is pretty scarce. Someone had to point out to me the significance of the cover below. It was sent from MERV ZAKASPS OB[last] 6 NOV 1888 to Finland. Well, Merv [Mary] an oasis of a few thousand people in the fairly lawless and Turkoman Kara Kum desert was only annexed by Russia in 1884. 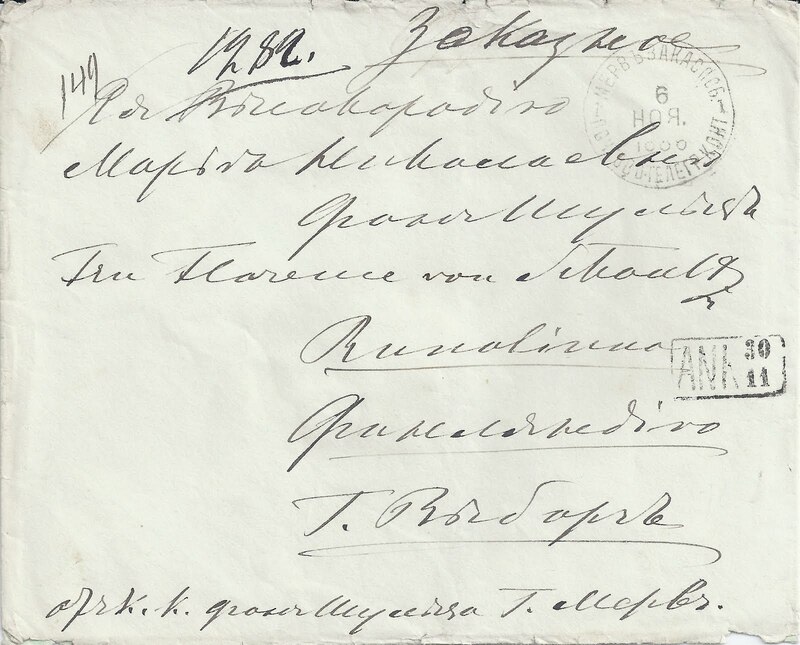 The Central Asian railroad from Krasnovodsk through Ashkabad only reached Merv in 1886, so this is a very early cover from the interior of the Transcaspian Oblast.